The Fiordland Arts Society is thrilled to host its 37th annual multi media art exhibition, at Labour Weekend (20 - 22 October, 2018). The exhibition will feature the work of guest artist: Angela Meecham, from Lawrence, who is an incredible felt maker, mixed media painting, and printmaker. Plus the work of Caley Hall, honorary member of the society, who will be exhibiting some of his highly sort after and finely crafted landscapes. As well as these two artists, there will be a wide variety of art on display from over 20 other artists from the Fiordland and Southland Region. The media will include everything from paintings, photography, glass, ceramic, woodwork, jewellery and sculptures. Note 1: From 2-4pm on Saturday the 20 October, the public will be able to enjoy a free afternoon tea while having the opportunity to meet the artists present. There may also be live entertainment by the Fiordland Players. 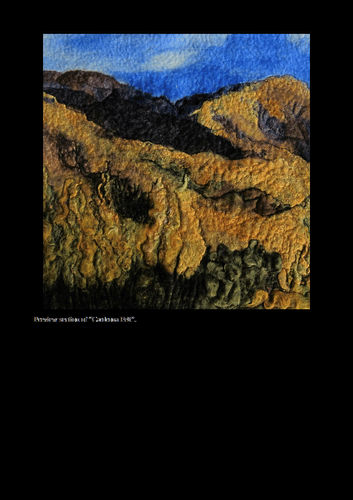 Note 2: The work of both the Fiordland Embroiderers Guild and Fiordland Creative Fibres Group will also be on display for the public to view. In short, this event will be a fabulous celebration of the creative talent and endeavours of the artists of the region. There will be something for everyone of all ages to marvel and enjoy. Please come and see and experience for yourself. Children free.